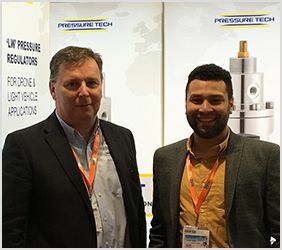 Pressure Tech MD, Steve Yorke-Robinson, and Technical Sales Engineer, Lemar Wright, recently returned from a very busy and successful Hannover Messe 2019 exhibition! We spent the week talking to existing and prospective customers about our expanding range of pressure regulators for the hydrogen fuel cell market - including the LW351, AUTO438, AUTO875 and RF1034. There was a lot of interest in our products and we're now working our way through getting back in touch with our new contacts. It's a good job we like being busy! 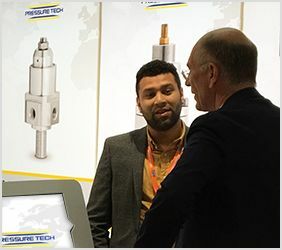 If you didn't get chance to talk to us during the show, please drop an email to sales@pressure-tech.com or call +44 (0)1457 899 307 - we're here to help!